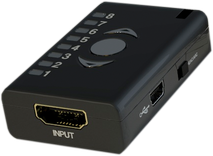 Doctor HDMI will solve most HDCP/HDMI issues by just being connected between source and display. Once connected it can be set on the fly to perform specific EDID and Hot plug event. There are a total of eight EDID banks inside the unit. When you press up or down button you can quickly move between any of them to select the desired one. Once you stop for a second or so, the system actually activates the selected EDID and starts the HPD (hot-plug) event. This is the event where Dr.HDMI will inform the source device that EDID has changed so the source must reconfigure it’s own internal settings. This takes about 2 seconds as per standards. During this time you will not be able to change the EDID. After HPD event concludes you are free to change edid again if wanted. If you press the middle button, the display’s EDID is copied and placed into the EDID bank number 8. Once it is done, HPD event is also created and completes in about 2 seconds. 1-5 : are presets factory configured and cannot be changed by user. However, They can be updated with a firmware update. 6-7 : are user configurable by the PC software. 8 : is the reserved one for downloading from the display. This device also has internal logic to support HDCP streams by sniffing all DDC packets and filtering the EDID requests but passing all HDCP handshakes. The PC software can be used to edit any of the parameters on the fly or it can be used to load/save any customer EDID. Power is either drawn from the HDMI connector or from the USB port if connected. Firmware upgrades can be sent with a single .exe file automatically so no additional software is needed. Just launch the .exe. To fix compatibility or handshake issue between source and display you can also try to move the switch on the side in one or the other position. 8. is the display EDID which can be read by pushing the middle button.